Scottish Borders Council’s planning committee unanimously agreed in September that the former Internacionale store at Douglas Bridge should be retained for retail use despite having been empty for the last three years. The old Internacionale store in Galashiels. The Department for Work and Pensions had sought to transfer its operations there from its home of the past 11 years at New Reiver House, behind High Street. The committee’s rejection of its bid was to prevent “loss of prime retail floorspace”. 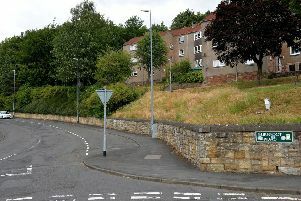 The department appealed against that verdict to the Scottish Government, and its appeal has now been upheld, much to the disappointment of Galashiels’ Scottish Borders councillors. Sandy Aitchison said: “As a constituency councillor, obviously I had to think long and hard about this decision, but I voted against because I am of the opinion that with the forthcoming Great Tapestry of Scotland project having the possibility of helping to regenerate the town centre, this particular shop would have been an ideal site for retail in the future, situated as it is on the way from the transport interchange to the tapestry site. “The government reporter has thought differently. Fellow independent councillor Harry Scott believes planners were acting in the best interests of the town when they rejected the application and that their decision should have stood. He said: “The application was rejected by local councillors who know their locality and who know and listened to their constituents. The appeal argued that the area would be enhanced by bringing an extra 150 people a day into the town. The reporter ruled that it was unreasonable to conclude the proposed use was likely to deter visitors, saying the development would generate “significant footfall”. Fellow Galashiels councillors Euan Jardine and Andy Anderson also supported the council’s original decision.